Projects Abroad has recently appeared in major US media outlets. 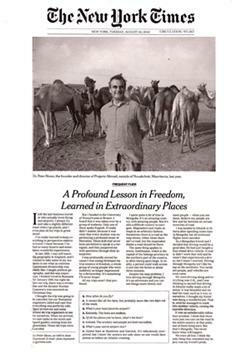 Most notably, founder and Director Dr. Peter Slowe was featured in the August 24th edition of The New York Times as the subject of their “Frequent Flier” column. Read the full article. On the same day the September edition of Budget Travel was released, in which Projects Abroad makes a number of appearances in the “Ask Trip Coach” section, including a quote from former Projects Abroad volunteer Emily Dennis. Also, be sure to pick up the September 13 issue of TIME Magazine, which features information on the Global Gap program in the Education section. See our More Info section for a complete list of Project Abroad’s media coverage.